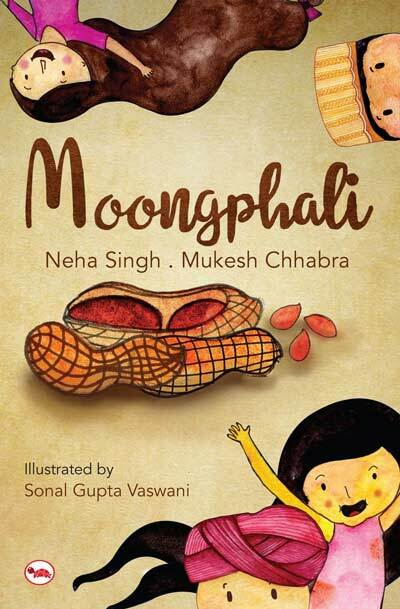 Moongphali is a collection of several captivating short stories for children. Right from the first story to the last, children are going to enjoy this book for sure. First story, The Watermelon God, is about Nandu who wish to dress up as a king for a fancy-dress competition in his school. But, his mother dress him up as a watermelon. Well, a hilarious adventure follows. The second story, Poonam’s Chappals, is about two Poonam, one rich and another poor. First Poonam receives a beautiful pair of slippers, but does she want it? In the third story, The mysterious Stones of Hanur, Sher and Samander travels far off to discover the mystery of mystic but gorgeous Hanur stones. All the stories are equally good and it’s hard to pick the best. Both the authors have done well with the stories, keeping it simple in a language that’s easy to understand for the kids and engrossing as well. The book straightaway evoke imagination. All the characters are lovable, and one can easily connect with them. Obviously, the kids are funny, adorable and adventurous. Another added bonus of the book is DIY tips at the end of each story. Even the cover is so interesting with an open pod of peanuts, just as the book itself is an open pod of different enriching stories. Each story is unique and hosts an interesting plot, with a good pace, humor and adventure. Overall, the book is a great read for the kids. Refreshing stories with a heart-warming experience with the adventures. All quick reads suitable as bedtime stories for the kids. The kids are just going to love them all. Recommended for children up to 7-8 years of age. Overall, Moongphali is a fine read. Refreshing, engaging, quick read. Interesting plot, with fine characters, and well-paced. Recommended to all readers who wants to read a short, romantic thriller.